Caption slip reads: "Photographer: Forbes. Date: 1954-04-20. Reporter: T.T. Assignment: Bank Ground-Breaking. 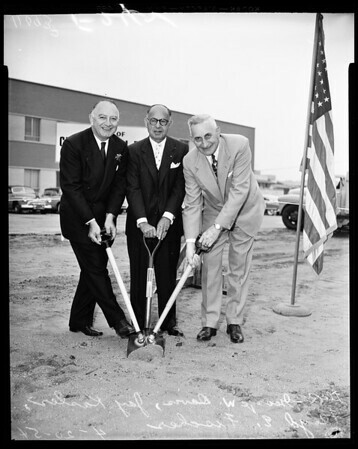 l. to r., 41/42/43: George W. Davis, president, Beverly Hills Chamber of Commerce, Jay Kasler, president of City National Bank, and Mayor Floyd E. Fischer, of Beverly Hills -- trio use unique three-handled shovel".